Angle - A figure formed by two rays, or sides, with a common endpoint called a vertex. Interior of an Angle- The set of all points between the sides of the angle. Exterior of an Angle - The set of points outside of the angle. - Measure of an angle is interior of an angle, measured in degrees. - One degree is 1/360 of a circle. - Angles can be measured with protractors. Acute Angle - An angle thatmeasures greater than 0º and less than 90º. Right Angle - An angle that measures 90º. 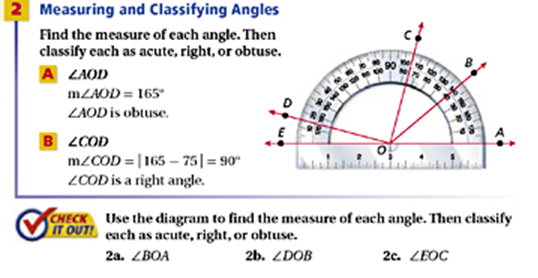 Obtuse Angle- An angle that measures greater than 90º and less than 180º. Straight Angle - An angle formed by two opposite rays and measures 180º. Congruent Angles - Angles that have the same measure. 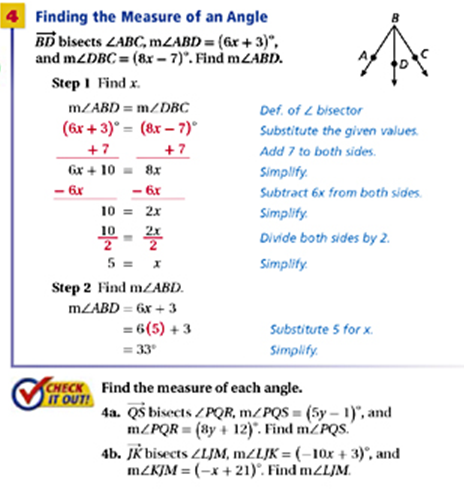 Postulate 1-3-2 - If S is the interior of angle PQR then the measure of angles PQS and SQR= the measure of angle PQR.